Mindful of needing to help out elsewhere in NEC Hall 1, I slotted my games into each morning of UK Games Expo‘s three days – and had full signs up for Fri/Sat and 5 of 6 for Sunday. I don’t especially enjoy 6-player games anymore, preferring 4 – 5, but for Expo and the burgeoning need for games, it makes sense. Friday morning was Symbaroum, and aside from my forgetting the name of the adventure so that one player wandered around Gladstone a whole circuit before I realised it was my game he had a ticket for, all went well. I think there were six games going on, so the noise level was low to moderate. Saturday morning was Doctor Who (using the Vortex system) and I had a group of 5 (with an explanation for the missing player due to a last moment change of plans). Three of the players were mother, father and son – which actually had no impact at all. At one point, Kelly (the mum) had a choice to save one character from three knocked unconscious by blow darts — and to my surprise she didn’t opt for her husband but rolled a die instead! I noted from running the system before that I keep forgetting Story Points – which allow you to retool, reduce damage, tweak the plot, etc. This time I came up with the idea of coopting Dread‘s Jenga mechanic as a means of providing a team Story Point pool with an added layer of tension. It worked beautifully – and stable tables permitting, I’ll use it again. I even managed to secure an official BBC-licenced Doctor Who branded ‘tumbling blocks’ set. Sunday, another session of Symbaroum. Not only did I get my 5 pre-signs, I also got a late addition to make up the sixth spot. Six dishonoured members of the Queen’s Watch head to Thistle Hold for punishment duty to make amends for their bad behaviour. 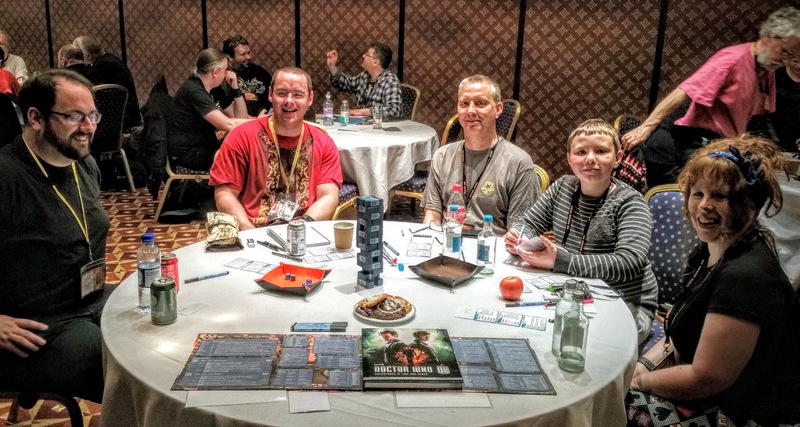 Session went well – although I found the six players always seemed to talk over each other or struggled to have themselves heard — and I found it hard to fairly keep track of who spoke first. For both Saturday and Sunday the noise level had increased to moderate, edging toward a low high. Nothing as bad as some events, but still meant I needed to raise my own voice a little to be heard. Actually facilities worked out well. Big room, reasonable lighting. Air con worked – and given we were by the swimming pool, no smell of chlorine. Last day had a slight issue with lighting levels, but soon got fixed. Had the chance to watch a feverish Gow working away on the back table on the second and third day, pulling together his last moment prep with customary finesse. First day I hadn’t clocked the need to pick up the GM pack from the Library – but got that sorted during a break. Never needed the meal delivery — though Julian suggested I needed fattening up. The players were great (that applies to all games equally). I enjoyed myself and think that three sessions might just be the sweet spot for me to stave off fatigue — and allow me time to help at the All Rolled Up stand and see some of the sights. Still hardly had a chance to buy anything, but that’s probably for the best.